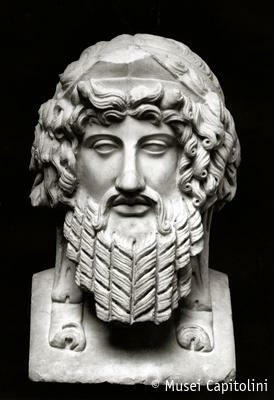 The bearded herm, featuring an unidentifiable divinity, wears a triangular diadem fastened by a broad band (tenia) with flaps falling on the shoulders. A pair of short horns protrude from above the forehead, partly hidden by the bushy locks of hair framing the face; the horns, the rather narrow eyes and the tense expression of the face give the herm something animal-like. The plastic modelling of the hair contrasts with that of the beard which consists in a series of flat cork-screw locks, whose linear rendering seems to stem from an original sculpture in bronze. The sculpture can be dated to the Antonine age.